More than 40 articles provide an extensive coverage of advances over the last three years of research on subarachnoid hemorrhage-induced brain injuries and cerebral vasospasm. Early brain injury, the new frontier of subarachnoid hemorrhage research, which may be a key contributor to the high mortality and morbidity, promotes collaborative efforts from neurosurgery, neurology, neuro-ICU into other interrelated fields and basic neurosciences. For the first time, subarachnoid hemorrhage research is almost equally divided by early brain injury and cerebral vasospasm, mechanistic investigations and therapeutic approaches, demonstrating a translational feature of the future direction. More than 40 articles provide an extensive coverage of advances over the last three years of research on clinical management of subarachnoid hemorrhage. 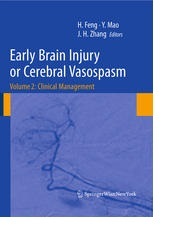 Novel experimental treatment strategies for early brain injury and cerebral vasospasm targeting genetic, molecular, and protein signaling pathways in preclinical models; surgical and endovascular treatment promote collaborative efforts from neurosurgery, neurology, radiology and neuro-ICU; advancement of neuroimaging provides guidance for new treatment strategies to reduce early brain injury and attenuate cerebral vasospasm.